The minute I included my first recipe, more people want me to cook. It's a noble effort, I do like cooking after all, I am just very, very lazy. I work fairly late on most days and by the time I get home, I really just don't want to spend any time in front of the stove. Convenience certainly has taken over. So, when Catty of the Catty life (not to be confused with cattylife) was asked to recommend somebody by those good people at Abel and Cole, I am sure she cackled a little and gave them my name. 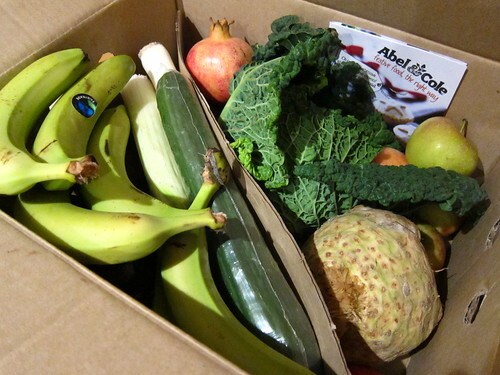 Abel and Cole specialise in delivering organic food straight to your front door. Healthy convenience food. So there it was, no sooner had my details been submitted, as if by magic a box full of fresh produce landed on my doorstep. It was full of sorts of wonders and opening up the box, it felt a little bit like Christmas. Half the fun was identifying what had arrived and I was now the proud owner of potatoes, fairtrade bananas, apples, leeks, cucumber, beetroot, celeriac to name just a few of the contents. The next question, what was I going to make? I slept on it and took my predicament to work. A short discussion with my Dutch workmate led me to a dish her mum used to cook for her, so here is my rendition of Dutch Pie, which isn't really a pie or Dutch. 1. Firstly, I would prepare the mash. I simply diced the potatoes and celeriac and boiled until soft enough to run through with a fork. Season then start mashing, adding in butter and a little cream if you are feeling particularly naughty. It needs to be smooth, get rid of the lumps but firm enough to form a topping. 2. Next up, the mince. Chop the leek finely and fry gently with the garlic until softened. Add the mince at this stage, gently browning it. Mix in the curry powder and fennel seeds. Blanche the spinach so that they just start to wilt and remove from the water. 3. OK, time to assemble. 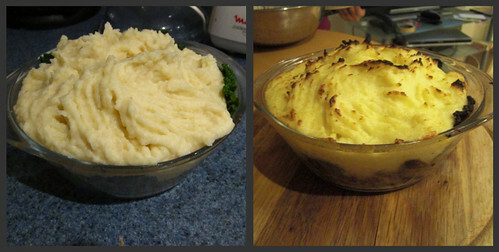 Get your pie dish, place a cabbage leaf on the bottom, and spoon half the mince mixture on top. Add another leaf of cabbage, and top again with the rest of the mince. Final leaf of cabbage on top, then pipe the mash on top. Glaze with egg or milk (if you want a super crisp topping) and then chuck it into the oven for as long as it takes for the top to brown. Probably about 15 minutes at a high heat (210 degrees should be good) but keep an eye on it. 4. Remove and dig in. I served mine with a simple homemade coleslaw, but that's only because that's what we fancied and had to hand. So there you go. It's not Dutch and it's just about a pie but I was quite pleased. Tasted good and wasn't that hard to put together. Oh, cackle I did not. I have faith in your cooking prowess Mr Teh and look at this result! DELISH looking pie. I want. 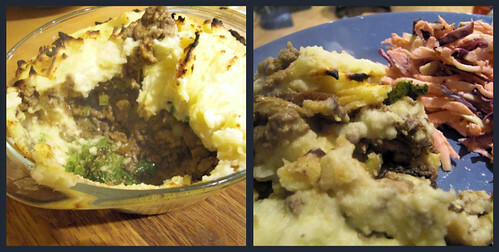 Curried mince with a mashed potato topping? Sounds different, but delicious. Hurrah for home cooking!